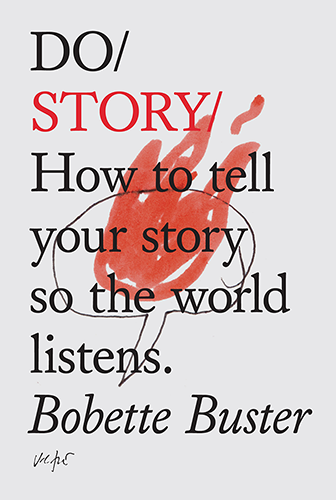 Bobette Buster, a story consultant, lecturer and screenwriter, covers a huge amount in the 112 pages of Do Story. The book – one of the “inspirational pocket guidebooks” by the independent publishing house The Do Book Company – is a beautifully inspiring exploration of storytelling, but is perhaps more so an encouragement to accept vulnerability and open up about ourselves. This is one of the reasons why I started this website back in 2012, as well as a huge incentive to keep writing. But there are many reasons to tell stories, as Do Story explores. Here are some of them. Perhaps use them as encouragement to open up to a friend, think about the storyline of your life so far, or start off by journaling. How well you tell your story can make the difference to anything you do – whether that’s convincing someone to love you, buy something you’ve made, or give something of themselves; or how well you make your way in the world; or, simply, in sharing who you are. 2. Stories connect us by illuminating common ground. 3. By telling and hearing stories we become inspired. We can envisage a better life for ourselves and become more courageous. 4. Stories provide clarity. They help us to understand our feelings and interpret the world around us. 5. Stories let us share our vision of ourself, our experience, and the world. 6. Stories develop our self-esteem. As Bobette Buster shares, it’s thought that the more a child knows his family’s ‘story’ – the better informed he is about his family and obstacles they have overcome in order to survive and thrive – the ‘stronger a child’s sense of control over his life, the higher his self-esteem’. In short, stories are prescriptions for courage. They illustrate how to run the race. And win. We are not born with courage. We may possess bravado, even arrogance. Youth normally does. But courage is a quiet, spiritual muscle discovered only when you face your greatest fear. Stories embolden, strengthen, and establish how we can become our very best. 8. By talking about the turning points in our lives, we can nurture the possibility of transformation. 9. Storytelling gives us a chance to discover who we are. 10. Our stories make us unique and exceptional. We’re the ones who can share them. Own your own narrative, risk your vulnerability, and tell your stories well. Do Story provides brilliant help for the journey. If you like Do Books, you might also like the 99u book series. They’re both inspiring and beautifully-produced additions to a bookshelf.